When flying out for a holiday escape in Tenerife most probably think to relax on holiday to the Canary Island and complete with swimming in the sea and lounging in the sun An outdoor explorer might be looking forward to a climb up Mount Teide, or the chance to explore Tenerife’s stunning scenery. What you might not know is that Tenerife is also home to some delightful Canary cuisine. Yes, so why not add a culinary adventure to your next Tenerife vacation, and try some local specialties? Gofio is a type of Canarian grain that was eaten by the Guanches, Tenerife’s original inhabitants, thousands of years ago. So, when you eat a spoonful of this dish, you’re literally getting a taste of the island’s history. The grain is mixed with fish stock and usually served with chunks of onion to dip into it. Escaldon de gofio is common in Canary home cooking. You’ll usually find it served in restaurants as either a started or part of a tapas platter. Gofio may not be flashy or fancy, but it is uniquely Canarian. Forget Irish spuds or Scottish tatties; papas arrugadas are the Canary take on potatoes. Tiny and wrinkled, these potatoes are boiled in salt water and then tossed in sea salt. They are served with mojo, a kind of salsa that comes in both spicy red or milder green varieties. 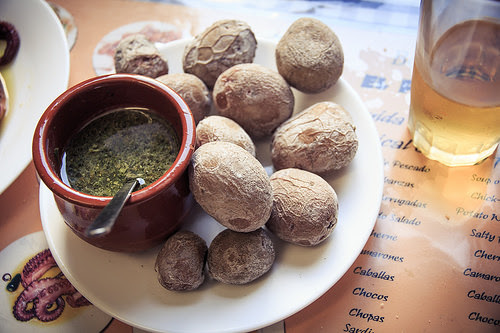 The best papas arrugadas on Tenerife are made from the island’s own Papa Negra potatoes. So, look out for these on the menu for the best possible tasting experience! The British aren’t the only ones with a weakness for battered fish. If you want to try a Canary dish, but you’re reluctant to leave behind what you know and love, churros de pescado is the meal for you. Fresh fish fillets are covered in delicious garlic, lemon, and parsley flavored marinade and batter before being deep fried. These crispy treats are served with alioli, a Spanish version of garlic mayonnaise. Image by secrettenerife.co.uk used under Creative Commons license CC by 2.0. You will come across some fantastic locally produced cheeses in Tenerife. 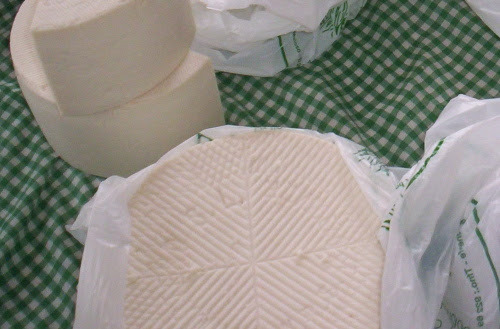 Most Tenerife cheese is made with goats’ milk, and sometimes this is mixed with sheep’s milk to change the consistency. Make sure you try ‘fresco,’ a type of cheese that is eaten when it is just a few days old, and has a lightly salted taste. Some other favorite cheeses produced in Tenerife include smoked ‘ahumado,’ as well as ‘pimiento,’ which is cheese coated in paprika. This is a common starter dish in Tenerife’s restaurants. Pimientos de padron are Spanish green peppers, rarely found in other countries. They are salted, fried, and served whole. As you bite them off the stem, you could be in for a surprise, because these little peppers can be sweet, hot, or anything in between. Have you tasted any incredible local dishes on your travels recently? Share your favorite food experiences below.